Guildford July 2007, Bowden Cup report. Saxon teams took a number of trophies home from the Bowden Cup mixed team competition in Guildford. Saxon fielded two teams. The Huscarls, named for the household warriors of Saxon nobility, was led by Paul Lowen, who fought foil along with epeeist Grant Smith and Sabreur Simon Whitaker. The Fyrd, after the feudal levy which made up the bulk of Saxon armies, consisted of captain and foilist Michael “Fred” Thomas, Kin-Ming Looi with his epee and the slashing blade of Andrew Ashmore. They quickly gelled as a team, taking a perverse pride at their implied peasant origins. Eleven teams were entered and each fencer fought in a poule unique against all other fencers of his weapons. Paul won the foil outright, with only one defeat and nine victories, winning a very fetching engraved tumbler for his efforts. Fred also had a strong result, attaining 4th place for his 7 up, 3 down. In the epee, Grant fenced well, peppering feet and knees to take second place (and an equally fetching, if slightly smaller, glass tumbler) with 9 up 1 down, whilst Ming held his own with 5 wins out of ten to finish 7th. Unfortunately the Sabreurs struggled somewhat. Simon was disappointed with his eighth place and Andrew propped up the table with one solitary victory. The Huscarls, then, were seeded 2nd in the 30 point, “Italian Relay” DE and won a bye through the incomplete round of 16. The 8th place Fyrd had to fight for a ¼ final place. Which they did in some style. Pitted against Guildford’s RKD, Andrew made amends for a disappointing morning, slashing and flunging a strong opponent, handing over to Ming just behind at 10-9. The epeeist was determined to overtake his opponent, and fought a tight, well judged bout to take a one point lead. Fred then outclassed the RKD foilist to take a comfortable team win. Next the Huscarls faced Guildford team RTM in their ¼ final. Paul, fencing first, was expected to put up a big win against his young opponent. He stuttered a little at first, then pulled away to give a 10-7 victory. Grant was next up, against the only fencer to beat him in the poule, the gentlemanly Tim Schofield. For the first ¾ of his bout he followed his plan and held on to the lead Paul had given to him, then he pushed too hard against the accurate counter-attacker and threw away the lead , leaving Simon a 1 point deficit to make up. Simon had the worst of the early exchanges against his female opponent. At 27-23 down, it looked like another disappointing result. Then the curly haired sabreur dug deep and scored three of his trademark wrist cuts in a row. His opponent was rattled and lost her composure whilst Simon maintained his momentum to overhaul her. Her banshee wail of despair said it all as the Huscarls won a thriller. Meanwhile the Fyrd faced The Sleepy Heads, a team of young talented fencers from Guildford, including the winners of both the individual epee and sabre. Andrew, first up went down 10-5 to Chris Schofield, a creditable performance against the strongest sabreur in the competition. Ming also fought gallantly against a superior opponent, the tall, fast, youthful and British top 100 ranked Gareth Thomas, but the Fyrd slipped further behind. Fred was the only one of the three to have an edge over his opponent, but it was never going to be enough to reel in the 12 point deficit, and the Fyrd went out fighting in the quarter finals for a 8th place overall. The Huscarl’s Semi final was against the Wimbledon Wombles, a team of veteran epeeist and sabreur with a young very able foilist. Grant was first up and fenced solidly before pulling away to a 10-6 lead. Simon’s opponent was a grizzled, canny experienced fencer and the Huscarl sabreur had no answer to him. The lead was reversed leaving Paul to make up a 5 point deficit. The fresh faced, slim young Tom Rowles, although lacking aggression, was an excellent defensive fencer with a top 50 British senior ranking. Paul, as ever, battled hard for every point, but was never going to be able to make up the points against such a fencer. The Huscarls thus bowed out in the semi final. But their fencing was not over. As they started to strip of sweaty jackets and plastrons, they were informed that there would be a play off for 3rd/4th place against Abingdon. Grant was first up against a stripy-socked youth he had beaten comfortably in the poule. Unfortunately his fencing came completely unraveled. He got his distance completely wrong and was very dejected at his 10-4 defeat, feeling he had cost his team-mates a podium place. However, he should have had more faith in his friends. Paul completely dominated his tall foil opponent and had already gone into the lead when he conceded the first point against him (to ironic applause from the crowd). In one of the performances of the day, he turned a 6 point deficit into a 4 point lead. Simon again stepped up to the plate and exchanged hits with the Nick Battam, who had placed second in the individual sabre Simon defending the lead despite considerable pressure from a strong fencer, giving the Huscarls a 30-27 victory, third place, and some more glassware. The Sleepy Heads, the young tyros who had beaten the Fyrd went on to comfortably win the final and take the Bowden Cup. Saxon can be very proud of their achievements at Guildford. They took away and individual first and second, a team third and a quarter final place. Simons progress continues, showing his mettle in DEs in high pressure situations. Andrew in his first competitive sabre competition improved as the day went on. The difference between his performance before and after lunch raising suspicions that the sausage rolls may have been spiked. Grant’s good poule was slightly tarnished by his hit and miss DE performances. Paul was superb throughout, being the bedrock of the Huscarl’s success and Fred and Ming both emerged with reputations enhanced. 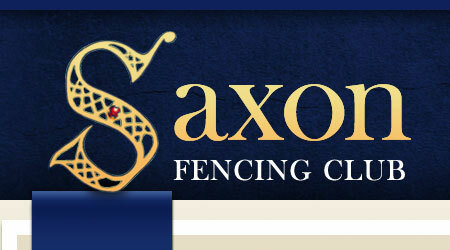 Most importantly Saxon put in an excellent showing as a club, fielding two teams who both fenced with distinction.